Scientists examining bits of old bone have uncovered evidence that Nostradamus, the famous sixteenth century mystic, may indeed have possessed amazing powers of prophecy. They have determined that he suffered from a rare brain condition called Transverse Memory Syndrome, sufferers of which are born with an important part of their brain pointing in the wrong direction. A typical symptom is a very poor short term memory, no long term memory, but the uncanny ability to see into the future. In short, their memories are the wrong way round - they 'remember' things that haven't actually happened yet. If it's true, this theory would explain many mysteries about the life and times of Nostradamus, in particular the questions surrounding his death. It is known that he died a victim of the terrible earthquake that struck Lyons in 1566, a disaster that took the lives of over six hundred people. Researchers have often wondered why, if Nostradamus was such an infallible prophet, he hadn't foreseen the event and made arrangements to be elsewhere. 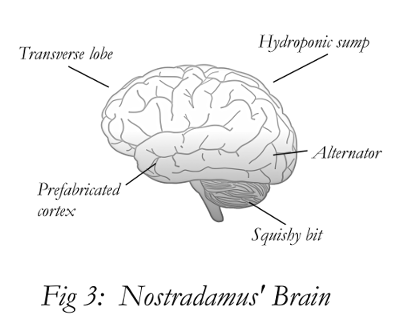 Well, now at last, Transverse Memory Syndrome offers a possible explanation - Nostradamus did indeed foresee the event and was desperate to leave the city, but he couldn't remember where he'd parked his horse.